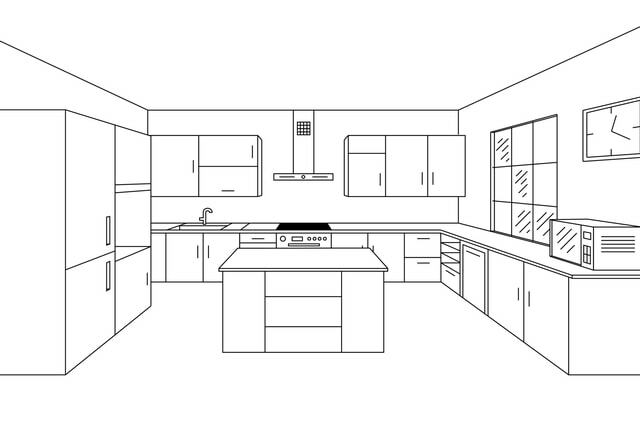 Kitchens line drawing. Image by Barrirret (via Shutterstock). What makes a good kitchen? One that is functional and easy to clean? Traditional design and the choice of electrical appliances? Or great design whatever style you choose? We at Stephen Cleary Carpentry are passionate about our kitchens. We work with our customers’ requirements and create a fitted kitchen that is easy to clean and functional, with a good choice of electrical appliances in whatever design they may choose. Our fitted kitchens are made from high quality materials. The wood we use and the stone in our worktops come from sustainably managed sources. All of our work is guaranteed. Where required, our electrical appliances are chosen for their reliability and energy efficiency. We can work with the mightiest and the smallest of spaces. Whatever challenges we face, Stephen Cleary and his team are able to fit quarts into pint pots. Before you choose to transform your kitchen, we will offer you a free no-obligation consultation. Once you agree to the works, we can turn your tired kitchen into one of your dream kitchens. We will negotiate a suitable time and date, then we can start work. For further information about our fitted kitchens, why not fill our form at the bottom of this page. You may prefer to call us on 046 9028374 or 086 2448792. We shall get back to you as soon as possible. Stephen Cleary Carpentry, 15 March 2017.